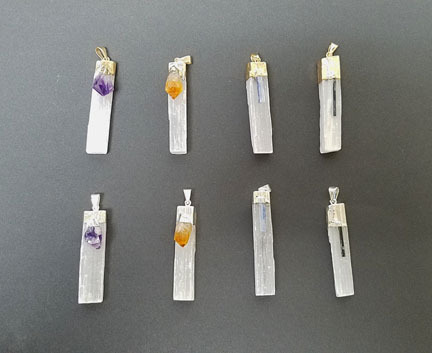 These pendants each contain a tumbled Quartz or Amethyst stone with a piece of Black Tourmaline mounted on the outside and mounted with a gold or silver plated bell cap. Approximately 1"L X .5"W. Comes with 18" gold or silver plated chain. These lovely polished points are gold or silver plated and are approximately 1.5"L X .5"W. Set with 4 small tumbled stones: Red Jasper, Quartz, Amethyst, and Aventurine. Comes with 18" gold or silver plated chain. 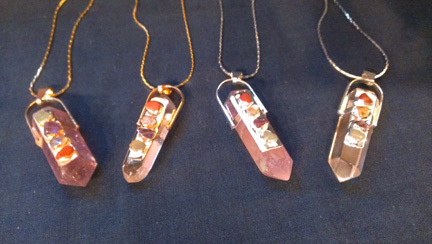 The polished crystal points are available in Quartz or Amethyst. Always stay in Balance with this pendant. 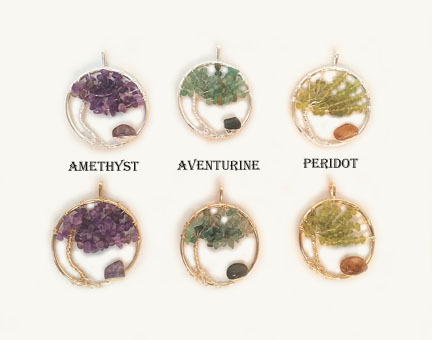 These stunning pendants each contain a rough Black Tourmaline piece mounted on the top with a gold or silver plated cap. Approximately 1"L X .5"W. Comes with 18" gold or silver plated chain. These gold or silver plated pendants are wire wrapped in the shape of the Tree of Life with tumbled stone "leaves" and a tumbled stone inset. 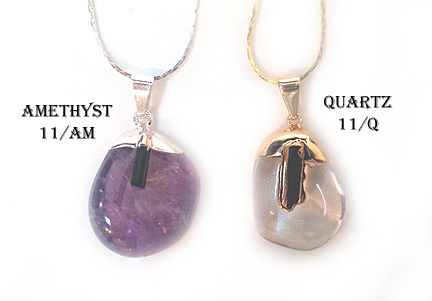 You can now chose from 3 different stone types: Amethyst, Aventurine, or Peridot! The Tree of Life is a universal symbol that can be found in the spiritual tradition of most cultures. At times, it is a 'cosmic tree' that all mystics must climb to understand the gods. The Tree of Life symbolizes Wisdom. Approximately 1.75"L X 1.75"W. Comes with 18" gold or silver plated chain. 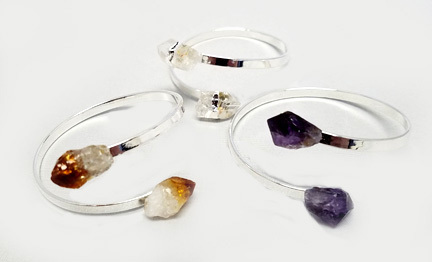 These silver-plated bracelets come in a selection of three different semi-precious stones: Amethyst, Citrine, and Quartz. Approximately 2" across with stone around .5" in size and priced at $ 6.25 each. 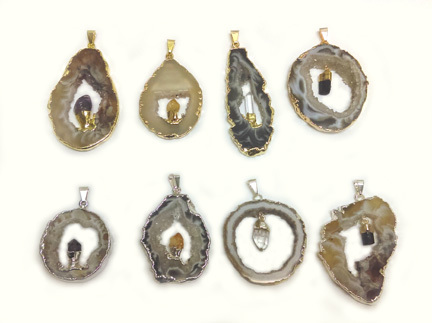 These pendants feature a gold or silver plated natural Agate Slice. Approximately 1.5"L X 1"W. Comes with 18" gold or silver plated chain. These beautiful Agate Geode Halves are gold or silver plated and are approximately 1"L X .5"W. Comes with 18" gold or silver plated chain. This marvelous gold or silver plated pendant is made from an Amethyst Cluster and comes with a gold or silver plated 18" chain. 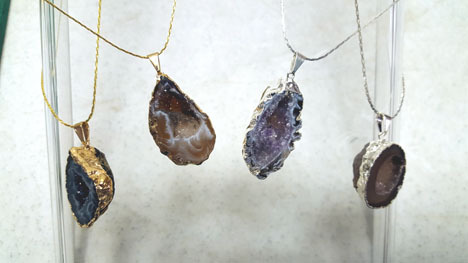 Approximately 1"L X .5"W.
These stunning Agate Geodes Slice Pendants each contain an unpolished crystal point in your choice of Amethyst, Quartz, Tourmaline, or Citrine accent which attached inside. Approximately 1.5"L X 1"W and comes with 18" gold or silver plated chain.